The Thompson Military M1A1 AEG is a battlefield weapon with a serious attitude. 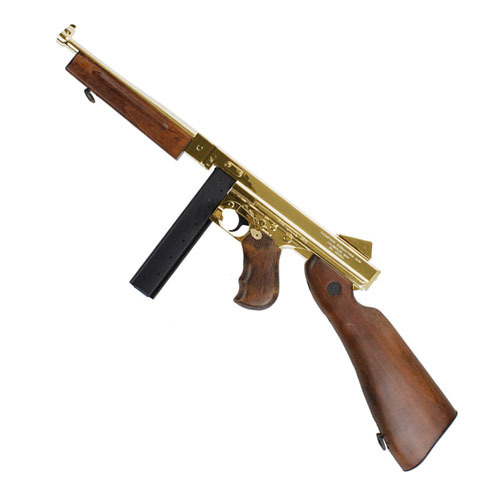 This beautiful gun is a fully licensed 1:1 scale replica of a real Tommy gun, and features a full metal body with artificial wood grain finish, a 60 Rd plastic magazine, and a shot velocity of 500 fps (using .20g BBs). The M1A1 also features an adjustable BAXS System for increased power and shooting accuracy. Airsoft enthusiasts will love the stunning classic era looks and awesome semi/fully automatic firepower of the Thompson Military M1A1 AEG. Do not miss this gun! Recommended for use with high quality .25g BBs.Comes with easily removable orange tip.